The real massage experience you will receive from the Northern Virginia School of Therapeutic Massage creates an inner confidence and personal momentum. Northern Virginia School of Therapeutic Massage prepares students to become successful massage therapists through an integrative approach to science, massage and bodywork. Students will gain a strong foundation in anatomy, physiology, and massage techniques to prepare them in the field of massage therapy. 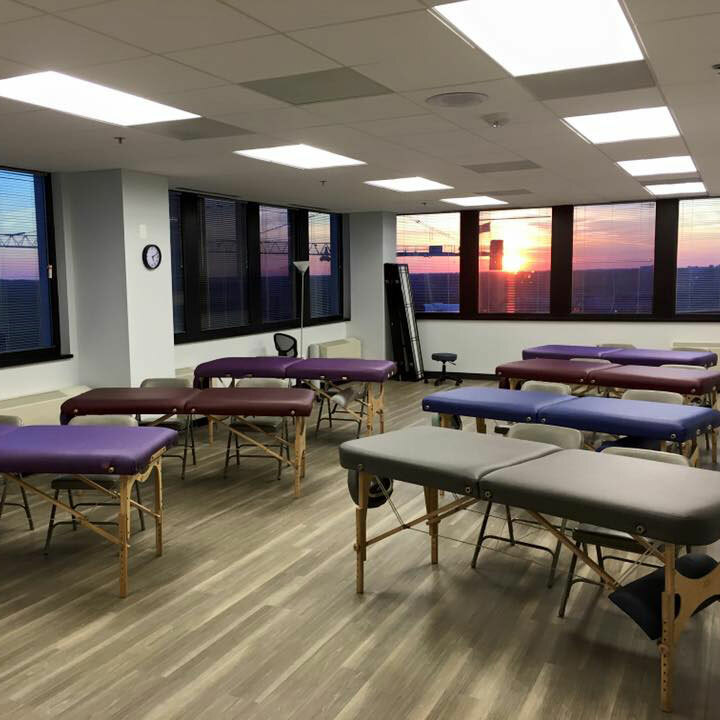 Graduates of the Northern Virginia School of Therapeutic Massage will be thoroughly prepared to sit for the Massage & Bodywork Licensing Examination. Class Hours: The intensive 600 hour massage therapy program is completed in 7 months. All day massage therapy classes are held Monday through Thursday 9:30 am -3:00 pm. All night massage therapy classes are held from Monday through Thursday 5:00 pm to 10:30 pm. All weekends massage therapy classes are held every Sunday 9:00 am - 6:30 pm and every other Saturday 9:00 am - 2:00 pm (a 13 month program). Massage Theory and Practice: Students will build a foundation for continued study in massage therapy and learn to give a full body massage using the five basic Swedish strokes to increase relaxation and reduce stress. Students will learn massage theory contraindications, effects of massage, draping, and proper body mechanics in order to give an effective massage and ensure client comfort. Anatomy and Physiology: Students will learn the anatomical organization and the physiological functions of the human body. Understanding anatomy, physiology and proper terminology will enable the student to modify a massage treatment in order to obtain a desired result. Kinesiology: Kinesiology is the study of movement in the human body. This course will explain the origin, insertion, and actions of the muscles that move the body. Students will develop skills in locating boney landmarks, muscles, tendons, ligaments and associated structures, so they can gain the ability to recognize the difference. This provides the student with the ability to understand the relationship and function of muscles so one can identify areas of dysfunction and pain. Pathology: This course provides the student with an understanding of disease, dysfunction, and conditions of the body that may be encountered in the practice of massage therapy. Topics include all of the body systems. Ethics: This course provides a defined understanding of the standards and professionalism necessary for massage therapists to properly represent themselves and the massage profession. Classroom discussion emphasizes ethical conduct and understanding the professional boundaries of massage therapy. Students will also review and discuss the National Certification Board for Therapeutic Massage and Bodywork Standards of Practice. Business: This course is an introduction to the basic business topics and practices relating to massage therapy. Topics include: the different types of business operations, start up requirements, marketing, and spa management. Deep Tissue Massage: Students will learn to identify tension in different layers of tissue and treat them appropriately. By using slow movements to unfold underlying tissue the student will learn to treat chronic postural tension and emotional trauma that is stored in the body. Sports Massage: This course is designed to give a student the skills necessary for working with an athlete. Students will learn specific massage techniques for pre-event massage, post-event massage, rehabilitative care and joint mobilization. Specific injuries will be explained and identified, and students will learn how to treat these injuries appropriately. Medical/Clinical Massage: This course will outline treatment goals for relieving musculoskeletal conditions and will prepare students to work both in the clinical and spa settings. The students will learn the most common conditions and apply foundational science to their massage practice. The course will deliver the progression from understanding each condition to assessing the client’s needs and working with the client. Pharmacology: This course provides students with the basic and necessary information on pharmacology and gives students the framework to better assess and treat clients. Students will learn about the most used medications and how they may affect massage treatment. This course is an introduction to understanding common medications in order to determine contraindications and the best massage treatment to use based on medications. Chair Massage: In this course, students will learn creative skills and techniques to perform a professional chair massage. Chair massage is a great marketing strategy to build ones practice. Traditional Chinese Medicine: Traditional Chinese Medicine looks for disharmony in the internal and external environment to treat and prevent disease. This course explores an introduction to the yin/yang concept, the five elements, the meridians, and basic shiatsu techniques. Students will learn the basic concepts and techniques. Reflexology: Reflexology is based on the theory that all body parts and organs correspond to points on the hands and feet. Proper techniques are taught to identify these specific points. The treatment of these reflexology points is performed to return the body to homeostasis. Hydrotherapy and Spa: Students will be able to use and describe different agents of heat and cold in body treatments. This course also gives students an introduction to spa procedures. Muscle Energy Techniques: METs are a contract/relax technique used to restore balance to muscles. Students will be able to understand the physiology of this concept and demonstrate the appropriate techniques. Clinic/Fieldwork: This course coordinates the students with the general public for massage therapy sessions, in which, the student will gain confidence and experience in different massage related circumstances. An instructor supervises all clinic and fieldwork sessions. Alternative Modalities: Students will be introduced to other therapeutic modalities available in the massage profession, so they can further study upon completion of the program to better serve their clientele. Graduation: Students must attend all required hours and pass all tests both theory and practical. Students must be in good financial standing and exhibit good conduct to successfully graduate. Upon completion of the program, students will receive a transcript, certificate and become eligible to sit for the Massage & Bodywork Licensing Examination. Attendance: Students are expected to attend every class and to be punctual. The instructor records all attendance. Tardiness is recorded by the instructor, rounded to the nearest quarter hour and calculated into the overall attendance. Students must maintain no less than average grade of 70% during the entire program. If a student falls below 70%, the student will be placed on a warning (see warning policy) until the next evaluation. Tutoring is available and the cost is $25/hour. Northern Virginia School of Therapeutic Massage offers job placement upon graduation, however, we do not guarantee job placement after completing the program. We maintain a list of job opportunities as they become available and after graduation students can contact the School's staff for guidance obtaining employment and obtaining letters of recommendation. Mission: Northern Virginia School of Therapeutic Massage provides an opportunity for one to obtain an education in all aspects of massage therapy, develop the necessary skills to sit for the Massage & Bodywork Licensing Examination and obtain employment as a massage therapist. Objective: The purpose of the Northern Virginia School of Therapeutic Massage is to deliver the highest quality education to our students. Graduates of the school will be thoroughly prepared for a successful career in professional massage therapy, and to sit for the Massage & Bodywork Licensing Examination. During the (600 hour) program the majority of the student's time will be spent in class receiving hands on instruction from the teacher and a portion of the student's time will be spent providing a supervised massage therapy service to the general public. The curriculum will be evaluated and revised at regular intervals to maintain the program's effectiveness and to evolve with changes in industry standards. Philosophy: Northern Virginia School of Therapeutic Massage prepares students to become successful massage therapists through an integrative approach to health and wellness. Students will gain a strong foundation in anatomy, physiology, massage theory and technique to prepare them in the field of massage therapy. An environment conducive to learning and an expansive curriculum is provided, so students have the education and training to become skilled, perceptive, and ethical massage therapists. Qualified, expert instructors offer students a variety of classic and innovative ways to understand all concepts of massage. The potential in massage therapy is endless; massage therapists can work in medical settings, spas, cruise ships, hotels, health clubs, and private practice. The program allows students to learn and grow personally, professionally, and academically in one of the fastest growing fields in the health care industry. Clothing should be loose, comfortable and clean. No low-cut or mid-drift shirts, tight jeans, short skirts/shorts, or dangling jewelry. Shoes should be worn at all times; socks must be worn if you choose not to wear shoes. All students are required to practice good personal hygiene and shower before coming to class. Nails should be kept clean and short. New Year’s Day, Fourth of July Week, Labor Day, Memorial Day, Thanksgiving Day, and the Week of Christmas. All other breaks will be announces before each start date. Northern Virginia School of Therapeutic Massage is conveniently located at 6402 Arlington Blvd. Suite 840, Falls Church, VA 22042. NVSTM is just inside the beltway, less than 1 mile from the East Falls Church metro and we have a free shuttle to and from East Falls Church Metro Station. The school is well equipped with massage tables, white boards, anatomy charts, skeletons, flat screen monitors, tablets, overhead projectors, and massage lotions & oils. A reference library is available to the students. Attendance: Students are expected to attend every class and to be punctual. The instructor records all attendance. Tardiness is recorded by the instructor, rounded to the nearest quarter hour and calculated into the overall attendance. Students are required to maintain a minimum pace of progress throughout the program. The pace of progress is measured by dividing the cumulative number of hours the student has completed by the cumulative number of hours scheduled. All students must maintain a 90% attendance average per payment period to be considered meeting SAP and to complete the program within the maximum timeframe. The maximum time frame a student has to complete is 111% of the program length. The program consists of two payment periods the first payment period consists of 1 – 300 scheduled hours, the second payment period consists of 301 – 600 scheduled hours. The SAP evaluation periods will be at 301 scheduled hours and 600 scheduled hours. If a student misses more than 10% of the program of the first payment period, he/she will be put on warning (see Warning Policy). It is the responsibility of the student to get any material missed due to absences. Absences may be excused by providing a written excuse approved and documented by the instructor. Unexcused absences must be made up. If a student is absent for several consecutive days, NVSTM will attempt to contact the student and make a determination of the student's intention to return to classes or withdraw within 14 consecutive days from the last date of attendance. If NVSTM determines the student to withdraw, the appropriate refund will be issued based on the last day of attendance and the NVSTM Refund Policy. Excused Absence Policy: An excused absence has to be approved and documented by an NVSTM Instructor. Approved excused absences are for: illness, family emergency or unforeseen circumstances. Excused Absences do not have to be made up. The total number of excused absences may not exceed ten percent of the clock hours in the payment period. Make up for unexcused absences will be determined on a case-by-case basis. Warning: Students failing to meet minimum requirements for attendance or academic progress at the mid-point (end of 1st payment period at 300 scheduled hours) will be placed on warning until the next evaluation period. During the warning period, students are considered to be making satisfactory academic progress and financial aid funds will be disbursed to eligible students. Students will be placed on an academic plan and must be able to meet requirements set forth in the plan by the end of the next evaluation. At the end of the warning period, the student's progress will be re-evaluated. If the student is meeting minimum requirements in both attendance and academics, he or she will be determined to be making satisfactory academic progress. If the student fails to meet minimum requirements, he or she will be terminated from Title IV programs and terminated from the program, unless the student appeals the decision and prevails upon appeal. Appeal Process: If a student is determined not to be making satisfactory academic progress, the student may appeal the determination within 10 calendar days. Reasons for which students may appeal a negative progress determination include death of a relative, injury or illness to student, or any other allowable mitigating circumstance. The student must submit a written appeal to the school with supporting documentation of the reasons why the determination should be reversed. The information should include what has changed about the student's situation that will allow them to achieve SAP by the next evaluation point. Appeals will be reviewed by the President and a decision will be made within 30 calendar days. The appeal and decision documents will be retained in the student file. If a student prevails upon appeal, the SAP determination will be reversed and federal financial aid will be reinstated, if applicable. Withdrawals: All withdrawals must be made in writing. The date of the institution's determination that the student withdrew should be no later than 14 calendar days after the student's last date of attendance as determined by the institution from its attendance records. The institution is not required to administratively withdraw a student who has been absent for 14 calendar days. However, after 14 calendar days, the institution is expected to have determined whether the student intends to return to classes or to withdraw. Students will be responsible for unattended classes until a written letter of withdrawal is received. Unofficial withdrawals for clock hour students are determined by the school through monitoring clock hour attendance at least every thirty (30) days. The refund is calculated based on the student’s last date of attendance. No refunds can be made if a student has attended 75% or more of the program, Students who have attended less than 75% of the program will receive a refund check within 30 days (see refund policy). Any student who withdraws from the program or fails to complete training will have a notice placed in his or her file as to the progress at the point of withdrawal. Students who withdraw prior to completion of the course and wish to re-enroll will return in the same satisfactory academic progress as at the time of withdrawal. Leave of Absences (LOA): A leave of absences is only granted in extreme cases, due to the nature of the program. Arrangements will be made to reenter the program at a point to be determined by the Director of Education. All LOA’s require a student to apply in writing and in advance of the LOA unless unforeseen circumstances prevent the student from doing so. A leave of absence extends a students’ contract period and maximum timeframe by the same number of days taken in the leave of absence. The time given for an LOA will not exceed half the program length. No additional charges are incurred to the student as a result of an LOA. If the student does not return at a mutually agreed upon time, the student will be dismissed from the program and is required to re-apply. If a student does not return from an LOA, when calculating the refund, the withdraw date will be the last day of attendance. Students returning from a leave of absence must return to school in the same satisfactory academic progress status they had prior their departure. Students are not eligible for federal student loans while on an LOA. Students who have received aid and fail to return can have their repayment grace period begin retroactively from the date the LOA began. Reentry: Students can re-apply by submitting a request to the Director of Education. If they have been dismissed or withdrawn from the program, students are readmitted on an individual basis, and a $50 reapplication fee may apply. Non-discrimination Policy: Northern Virginia School of Therapeutic Massage prohibits discrimination against current and prospective students and employees on the basis of race, color, religion, national origin, age, gender or sexual orientation. Student Records: Student records are kept confidential and will not be released or published as “directory information” without written consent from the student. The school shall provide and permit access to student’s records as required for any accreditation process initiated by the institution, NACCAS or licensing body. Students have the right to all records on file. Official Transcripts and Diplomas are available upon request. Cell Phones: All cell phones must be turned off during class.